Our family’s life over the past month has been dominated by eggs. Eggs – those round or oval reproductive bodies produced by the female of certain animals – are everywhere: in our yard, in our refrigerator, on our kitchen windowsill, on our plates. The most obvious reason for this is our acquisition of ten hens (and a rooster) from friends who were thinning out their flock. The chickens are all at least two years of age, which is around peak laying age. The good thing about this: We got eggs right away! On the other hand: It’s all downhill from here. We needn’t have worried: Our chickens were just stressed from their move. After a few days, they began laying seven or eight eggs a day. It’s impossible to overstate the magic of going out to the chicken coop and discovering a perfectly oval, still-warm, brown, green, or blue egg nestled in among the pine shavings. The novelty has yet to wear off for our daughters, who run out to check for eggs three or four times a day. “Thank you, chickens!” they exclaim whenever they find a fresh one. Seven or eight eggs a day is a lot, even for a family of six. The three full egg cartons in our refrigerator contain a hybrid mix of our hens’ eggs and the remaining store-bought eggs from our pre-chicken days. The blue bowl on our kitchen windowsill is brimming with the latest egg harvest, since fresh, unwashed eggs can keep for up to two weeks unrefrigerated. Yesterday, on two separate occasions, our daughters dropped and broke eggs that they were bringing in from the coop. A couple of weeks ago, this would have been met with a scolding; now I can almost shrug it off. There are always more eggs coming. My daughter found the robin’s egg on the ground outside a friend’s house. A delicate oval of beautiful blue, far from any visible nest or tree. “I’m going to hatch this,” she said, cupping it between her hands as if incubating it immediately. “Um,” I began, trying to choose my words delicately. How to explain that whatever was inside that egg was probably long gone? We had no idea the circumstances under which it had been lost or abandoned, no idea how long it had been lying on the ground. We had no knowledge or equipment with which we could attempt to hatch that egg. She took the egg along with her on a drive to Burlington to take her grandparents the airport. When she returned, she said, “You were right, Mama; there wasn’t anything alive in there.” With a shrug, she showed me the egg with the hole in it where she’d accidentally stuck her finger. Egg white and yolk were visible through the hole. I cleaned out that egg and placed it on our nature table, hole-side down. When I looked at it a few days later, one of my daughters had hidden a little treasure, a tiny fake jewel, inside it. I didn’t tell my daughter that, just because there was only yolk and white inside that egg, chances are that it was alive, once. Chances are that the eggs we get from our chickens are fertilized, too. Because we have a rooster, and because rooster sperm is viable inside a hen’s body for weeks, it’s likely that if we kept some of our eggs instead of eating them, we’d end up with chicks. Perhaps someday we will, but we’ll have to use a mechanical incubator; thus far, none of our hens has shown any maternal instinct (known in poultry parlance as “broodiness.”) They lay their eggs, accompanied by a fanfare of loud clucking by the other hens, which I like to think of as a sisterly celebration of fertility (“An egg! An egg! Go, Henrietta!”) Then they hop out of the nesting box and go about their business, without a care in the world, completely unconcerned that small children are carrying away the fruits of their labors. Yesterday morning, as I was making coffee, I looked out the kitchen window and saw a snapping turtle perched on top of our septic mound. She was still there when my daughters woke up, so I sent them out to investigate. They came back inside and reported that the snapping turtle was digging a hole. “Maybe she’s getting ready to lay eggs,” we speculated. The turtle’s behavior proved us right: After she dug the hole, she took a long, slow stroll through our yard, then returned to her hole and sat on it until lunchtime, through a steady downpour of rain. Snapping turtles often lay up to 20 ping-pong-ball-sized eggs in their nests, which takes a while. “What’s she going to do after she lays the eggs?” my daughter asked, about halfway through the turtle’s labor. I explained that she was going to walk away. “Huh. Doesn’t seem like she’s a very good mother,” my daughter huffed. I wish my own daughters gave me as much credit. We have eggs-to-be, in the form of six ducks that we’ve raised from day-old ducklings, who should begin laying in early fall. And, for a time, we had eggs-that-were, in the form of a bowl full of tadpoles from my daughter’s preschool. Although not exactly eggs, the tadpoles had the feeling of eggs because they were life in the becoming-but-not-yet stage. We watched their little tails wriggle, and kept an eye out for tiny legs. One morning, a couple days after I’d said, “You really should change that water,” we looked in the tadpole bowl and saw that several of them were dead, floating on rafts of slime. We released the surviving tadpoles into the pond in our yard, and buried the dead. My daughters, never ones to skimp on ceremony, made headstones out of rocks, adorned with flowers from the garden. Then, they held a funeral service. It occurs to me that the blessing and curse of the human condition is that, for most of us, it’s impossible to be like those egg-laying animal mothers who can stroll away from their offspring without a backwards glance. We can’t quite fathom this lack of attachment, this ignorance of the outcome of reproduction. Instead, we cup their eggs in our hands, we incubate their babies, we bury their dead. Would I trade the pain of love and attachment for the luxury of not having to consider when to give my children smartphones, strategize about college admissions, or worry about them repeating my own mistakes? 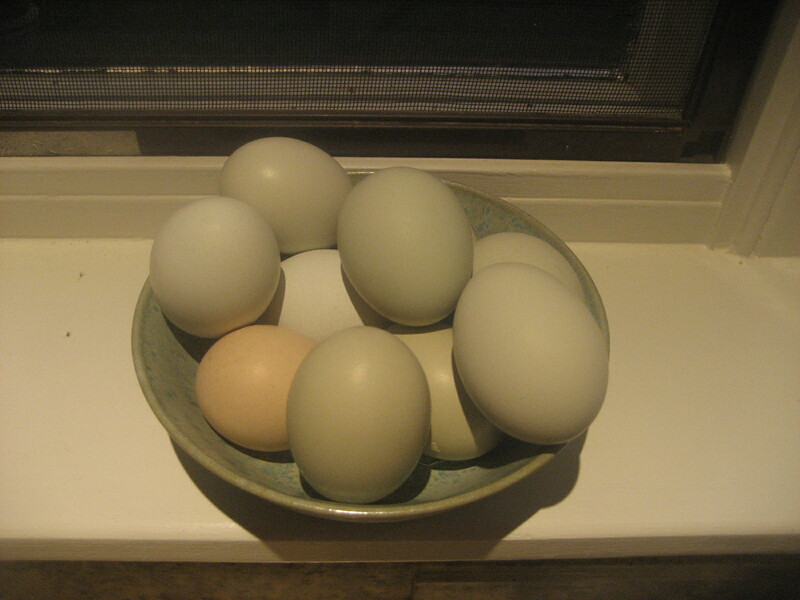 I think not, but the bowl of eggs on my windowsill reminds me that it’s possible to hold more loosely.